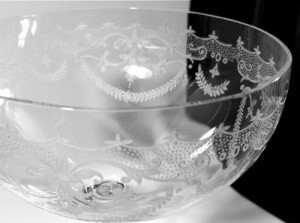 As many of you know, we have somewhat of an obsession with antique glassware. But, our interest doesn't actually force us to buy every stem that we see. With only a few exceptions, we try to find good values when out on the hunt. We like knowing that we have something unique, but that we didn't have to pay an arm and leg for it. That way we can use them at parties and won't be upset should an accident occur. Some people like matched sets. We understand that, and used to feel that way too, but one of the joys of owning even a single stem of a given style is that it helps to underscore how each cocktail you serve is unique. Rarely do guests all want the same thing, and giving them their selection in a special cocktail glass is another way to enhance the experience and emphasize their choice. We have often written about how you shouldn't let something like glassware get in the way of trying a recipe, and we still believe that. However, we also understand that sometimes one particular glass is better at bringing out the best qualities in a drink than another. Take, for instance, the Irish Coffee served at the Buena Vista San Francisco. 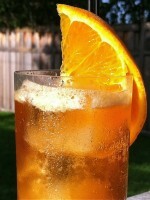 They only use the Libbey model 8054 glass. 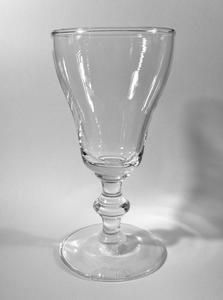 This six ounce glass is from the "Georgian" line, an elegant, footed style with some very interesting qualities. The shape, it turns out, plays an important role in the quality of the Irish Coffee they serve. With glass that gets thicker toward the bottom of the bowl, it can withstand the high temperatures of coffee without breaking, and once hot, retain that heat as the customer enjoys the drink. The Buena Vista serves thousands of Irish Coffees in these glasses every single day. So when word began to circulate that Libbey had discontinued the mold, supplies started to dwindle. Before long, not a single 8054 was available for purchase anywhere. In order to resume production, Libbey required a very large order—upwards of $250,000. It wasn't a national tragedy, but certainly a problem for the Buena Vista and anyone else in San Francisco serving their Irish Coffee in the same glass. Other glasses were tried, but nothing could match the virtues of the 8054. Reports were starting to appear that folks were getting worried and were declaring the end of the Irish Coffee in San Francisco. When Libbey found out about this, they offered to waive the costs and restarted production. Disaster averted, everyone can now rest easy knowing that nothing will happen to the iconic Irish Coffee. It may sound silly, but there is a serious side to using the right glass for your drink. Not everyone agrees, but we think there is something to be said for sipping a Moscow Mule out of a copper mug, or a Mint Julep from frosted sterling silver. Don't even get us started about wine. But, aside from a handful of drinks specifically known for certain glasses, many cocktails—especially those served up—work equally well in a variety of styles. So, when we are out looking for glassware, we are usually looking for cocktail coupes. When we find a good price, we grab it. Most of the collection has made its way into the images you see here every week, and as much as we enjoy using these glasses, we recognize that we can't possibly use them all. We want to share them, so most of our glassware is now available in the Antique/Vintage Store. We have tried to keep the prices reasonable, and proceeds will help keep the website going. Quantities are always limited but displayed, so keep that in mind if you see something you like. We also carefully measure everything and tell you how many ounces each item holds right to the rim. Antiques have probably been used, so don't come looking for perfection, but DO come looking! 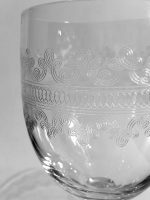 That's not to say anything is chipped or broken, but vintage glass is often mouth-blown and can have air bubbles, waves and ripples. 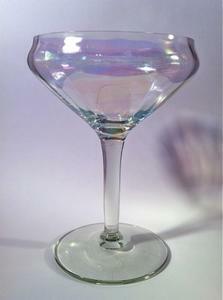 Sets of glasses can reveal slight variations. The pictures here should give you some idea of what to expect, but the store gallery features closer views of some and examples of what was made in them for others. We hope to grow the selection, but if you see something you like, don't hesitate. There are no backorders or re-orders here. What we have is what you can buy. If you have any questions or you are looking for something specific, let us know and we will keep a lookout. Cheers, and thanks for shopping! The value of any antique will depend on what someone is willing to pay. In other words, if you were to sell it, the value is the highest price you can get. That's not a very helpful answer, so you would need to either consult an expert who knows the specific make/model of your glass, or find a similar glass that has recently sold. You could try searching eBay for past, closed auctions (this is an advanced search option) and see what the final sale price was. That will tell you exactly what someone paid, and if yours is similar, may help you determine its value if you wanted to sell it too. Sometimes, items sell lower than they should because they were not properly advertised, but generally speaking, if you can find several previous sales and the prices are similar, you will have a good idea about what someone is willing to spend. If yours is an important piece from a reputable designer, that would be an important detail to help find similar sales. However, the best designs are often copied, so would want to ensure yours is authentic if it matches something that is highly prized. 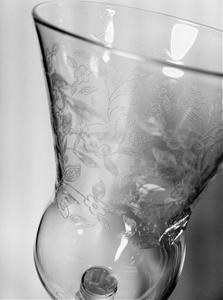 The glassware we sell in our Antique/Vintage store comes from our personal collection. We love to hunt for items at antique shops and estate sales. We buy glasses we think work nicely for cocktails like those pictured here on the website. If we think we find a bargain price, we will buy the glasses and pass those savings on to our readers. We aren't trying to make a living selling glassware. It's a hobby that helps support the site and allows readers one place to obtain a variety of styles, shapes and sizes. It's worth noting that a pontil is merely a result of how it was made. In some cases it means it was hand-blown, but it's possible to fire-polish pontils so they don't detract from the design, or use the spot to stamp a hallmark. Often, a pontil is thought to indicate age, but even modern glass blowers may leave pontils on their work, or mass-produced items will have pontils because the manufacturer isn't taking the time to clean up these marks. I have 7 of the classic Irish whiskey glasses from Buena Vista. Bought them about 25 years ago. Any value? Thanks. They don’t have increased value now that Libbey is making these again.